Science and fashion have collided yet again. Remember those shoes from Back To The Future that tied themselves? Well, now that's a reality. Inspired by the cult classic sci-fi movie, Nike created self-lacing shoes that you can actually buy, according to The Verge. All you have to do is slip the kicks on, press a button, and you're ready to walk out the door. It's that easy! The Verge reports that starting Nov. 28, the future is going to become reality. Nike created the HyperAdapt 1.0 shoes that actually adjust to your foot when you put them on. With the push of a button, you can get a perfectly tightened fit. Tinker Hatfield, vice president of design at Nike, even has a name for the kicks — E.A.R.L., which stands for electro-adaptive reaction lace, according to Wired. So how does it work? As a video by Wired demonstrates, it has a lace-engine in the bottom of the shoe that uses fly-lace technology to sense the pressure of your foot. There's a tiny plus and minus button that you can use to adjust the shoe throughout the day too. The only downfall to the idea is that you have to charge the shoe. Tiffany Beers, senior innovator at Nike, said in the Wired video that the charge takes about three hours and lasts two weeks. The look of the footwear is similar to any other Nike you might see, with the exception that they light up. As shown in the Wired video, the shoes change colors when you click the plus or minus button as well as when your battery is running low. Until now, light up shoes were just something flashy to add to the appearance. Now it's a way for the shoe to actually talk to you. 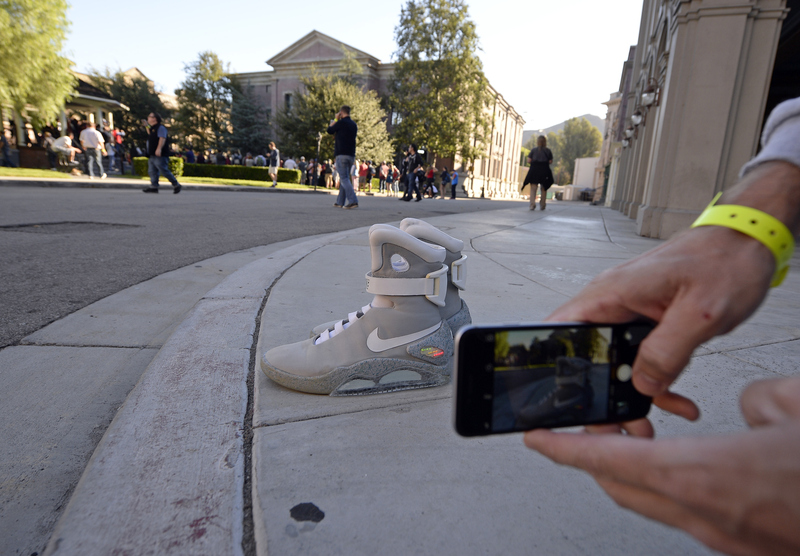 According to the Wired article, the idea for the shoe actually came straight from Back To The Future. The only difference is that in the movie, according to The Verge, cast and crew were actually underneath the stage pulling the shoe's strings. Well, not anymore! "It's also worth noting that the thick nylon laces you see on the top of the sneaker are just 'visual aids' — they tighten, but they're not what's keeping the shoe hugged to your foot," The Verge added. It takes anywhere form two to five seconds to ties your shoe, even with the fastest shoe-tying possible, according to The Daily Mail UK. Well, this shoe cuts that time in half. The video shows that it takes less than a second to tie the Nike HyperAdapt 1.0. That's a serious time saver. Not to mention how awesome this invention is for people that can't physically tie their shoes. If you think this is all just for show, think again. Beers says in the video that the shoe was designed with athletes in mind. She says that it's now easier than every for someone to easily loosen their shoe at halftime or during a marathon when their foot begins to swell. Sounds like an all-around great invention to me. There's no word on how much the HyperAdapt 1.0s are yet. If you're interested in these sci-fi kicks, mark your calendars for Nov. 28. They'll be available at select U.S. stores, so I'd suggest calling ahead to your local store.